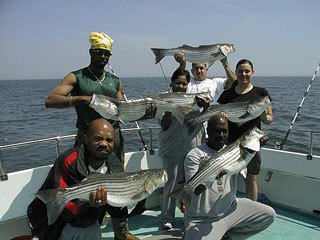 And here we have the Mike Fox (center) crew, who caught some great rockfish to 39 inches on April 29. From left to right, that's Mike, Kevin, the "Fox Man", Steve, and Sam. 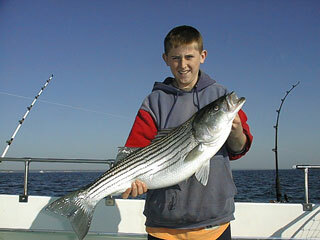 And Kevin took top honors for the day, shown here with his 39 inch "money winner". April 28: Although the Bay was calm at daybreak, the winds were approaching small craft warning (not a problem for the Worm) by 10 am. 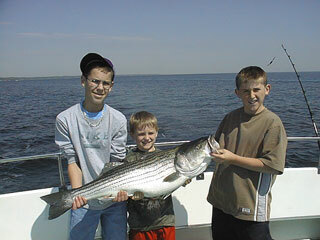 But the Will Gustaitus (right) crew caught rockfish to 41 inches. From left to right, that's Nester, Jenny, Pat, Sheri and Will. 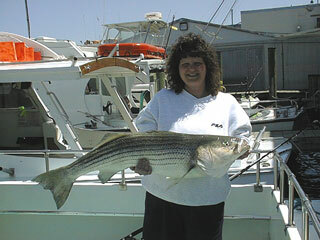 And here's Sheri with the big fish of the day, a beautiful 41 inch trophy. Look, calm water! 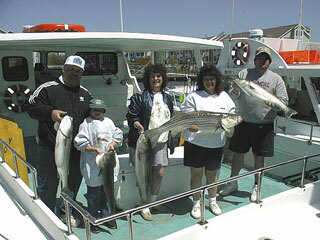 On April 27, Buddy Duvall (right) and crew had a cool but calm day of catching big rockfish to 39 inches. From left to right, that's Brad, Dane, Travis, Captain Drew, and Buddy. Brad, Travis and Dane team up to show off the 39 inch rocky. Here's Dane with the first fish of the day, a fine 34 incher. 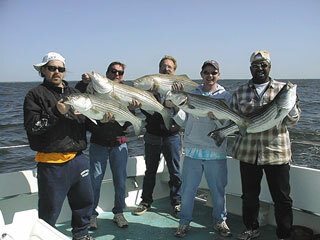 For a change, the weather cooperated on April 26 and obviously so did the rockfish, as evidenced by the Louie Hugg crew. From left to right, that's Brian, John, Joe, Louie, Mike, and Rob. Catching was good again today. 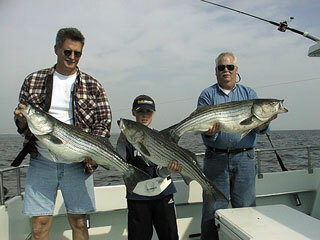 Flanked by Kevin (left) and Alex (right), here we have Victor "The Boss" Serebruany and their catch of fine rockfish to 37 inches. The weather on April 25 was nasty but the catching was good. 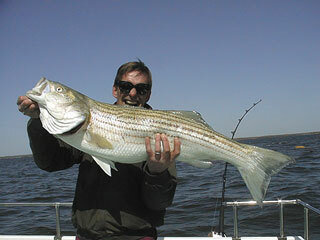 The 2001 Spring Rockfish season opened a few days ago with cool weather and cooler water temperatures. The catch shown here is typical of the last few days -- most of the fish have been 31-32 inches with few small fish and very few 40 inchers. This is the Devin Watson (front left) crew of April 23. To the right of Devin is Tony, in front of Travis, Melosan, Jose, and Danielle. 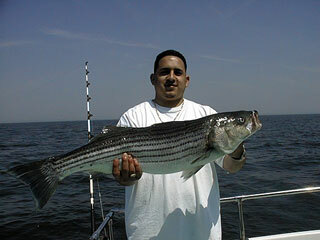 Catch of the day went to Jose with a nice 36 inch trophy rockfish. 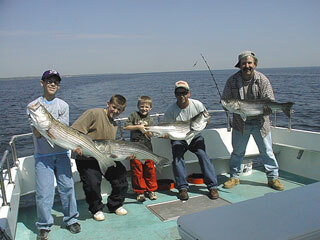 And here we have the Ron Crabbe (right) crew on the morning of April 22. That's Dave on the left, with Ron's son Brian in the middle. Ron caught the largest fish of the day, just under 40 inches. For more crew photos, click here. 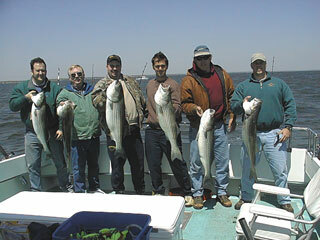 Under overcast skies on April 21, here's the Robert Young crew with their catch to 37 inches. From left to right, that's Bob Sr., Robert, Steven, Mike, Ken and Andy (front). Nice catch guys (sorry for the poor photo). And here we have the Larry Plew crew from April 20, opening day. From left to right, that's Maurice, Wayne, Eric, Eric, Ron, and Larry. Everyone had a great time -- it's opening day! There's only one first fish of the season. This year that honor goes to Maurice, with a 32 inch keeper.